I’ve seen a lot of closets in my day and ones which look blown apart are the norm, not the exception. 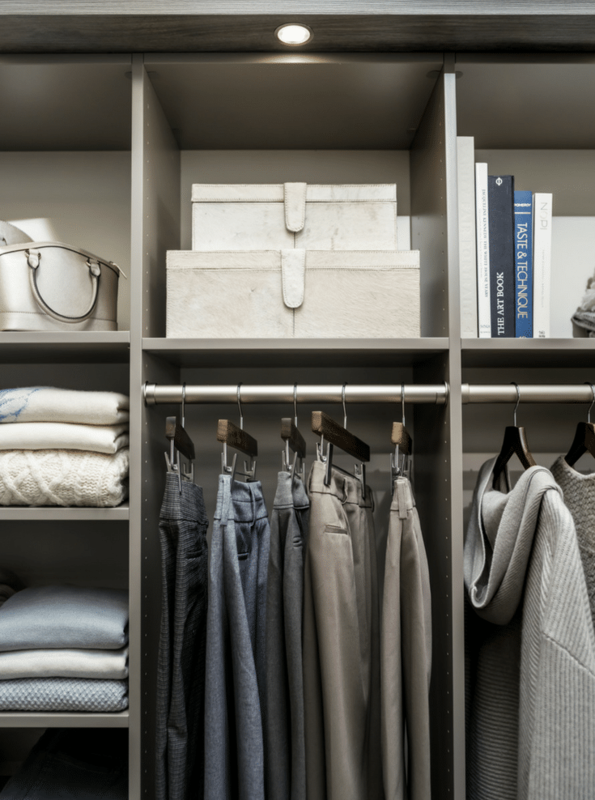 Although closets are generally made up of 3 basic components (they are (1) hanging space (2) shelves and (3) drawers), the biggest area (and the biggest mess) are the hanging clothes. If your closet resembles this remark, raise your hand now. 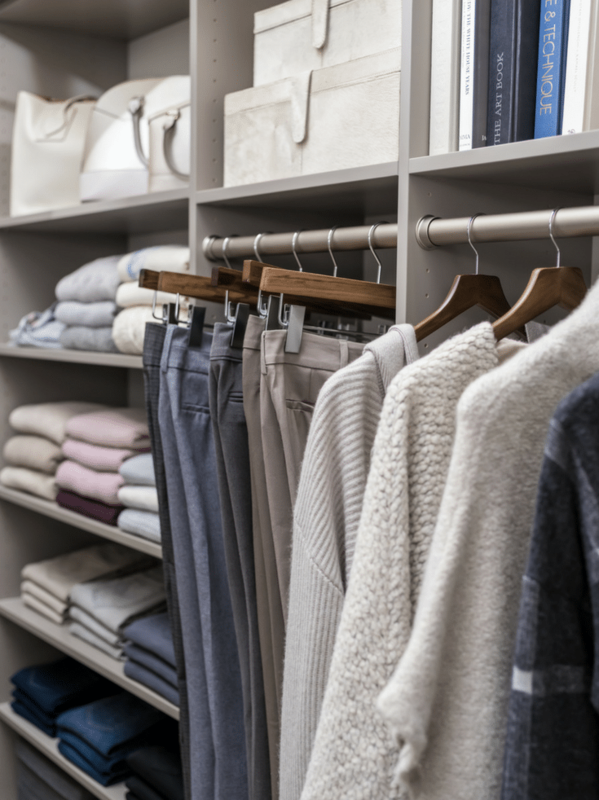 It’s simple to ID your hanging space as the toxic waste zone of your closet, the key question is what are you (or can you) do to fix it? 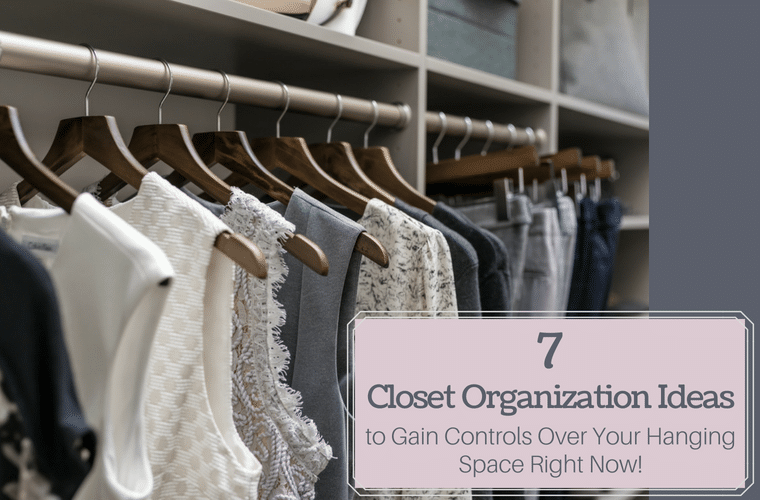 In this article my goal is to give you 7 practical tips to gain control over your closet hanging beast. At the end let me know which tips helped the most, and chime in with ideas which have worked for you – so you can help others. The biggest problem with hanging clothes in your closet results from the builder only putting in one rod 60” to 72” off the floor. This single rod – by default – assumes the best way to hang all your clothes (irrespective of how tall they are) is at the same height. You know your long dresses hang much further than pants folded over a hanger. For longer hanging dresses you’ll want to set the closet poles 66” from the ground. For medium length suits and moderate length dresses 54” is the recommended. This will give you room for at least one extra shelf above. For everyday blouses, shirts and pants (folded over) it’s smart to use double hanging sections (i.e. there will be 2 rods in one section) and put the lower pole at 40” and the upper one at 82”. If you’ve got young kids (in the toddler ages) you can get 3 rods per section (because their clothes are extremely short) to get the maximum storage in a reach in closet. As they get older (yes – this is sad, but true), simply take one rod out and convert it to a double hanging section. Tip #2 – Becoming a ‘closet Nazi.’ Demand hanger uniformity. So, what does Seinfeld and the soup Nazi have to do with hanging in your closet? Good question. 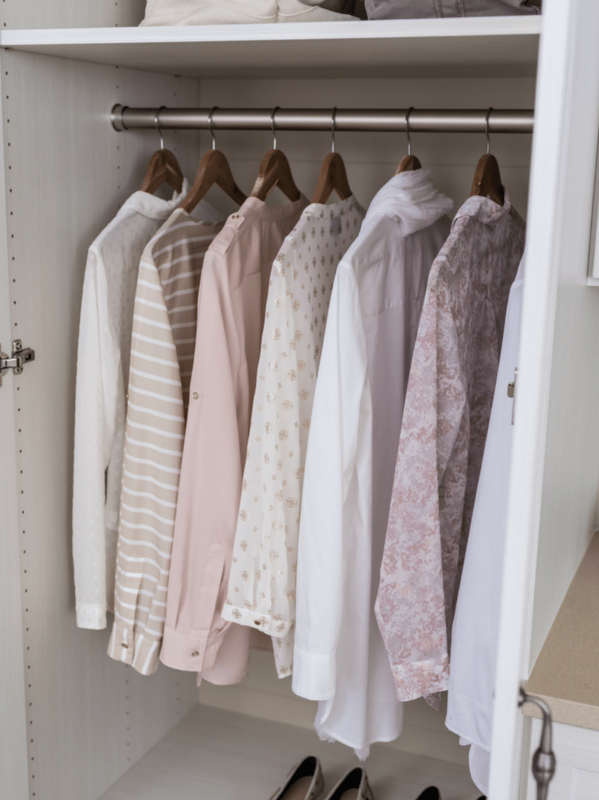 If you want a stylish bedroom closet, you need to embrace the role of the ‘closet hanger Nazi.” You need to insist on using only one type of hanger (or at least one type of hanger per closet section). You may be asking why? First, go out on Pinterest and look at the glam closets and what do you find? I’ll bet you they’re embracing the ‘closet hanger Nazi lifestyle’ with one type of hanger. All the clothes are hanging in one direction and the hangers are the same type. You’ll find ZERO (nada, nient) wire hangers from the cleaners. It’s impossible to have a neat closet if there’s too much stuff hanging in it (right now you’re probably thinking – thanks for those amazing words of wisdom, genius! I get it, I resemble that remark). Step 1 – I donated every piece of clothing I hadn’t worn in a year. I rounded up 6 large 30-gallon plastic bags of stuff. I miss none of these things today. Step 2 – When I buy something new (more likely when my wife buys something new for me – I’m not a big shopper), I find one item to donate. I do not let my closet to grow even one garment EVER. If you’re reading this and saying, “Mike – I just can’t get rid of anything.” In this situation, I would tell you to get professional help. OK – not that type of professional but choose a closet organizing professional. There are many in Columbus (and I even know one good one I can refer you to), who can help you eliminate clutter when you don’t have the self-discipline to do it yourself. Tip #4 – Use the more effective ‘no-hanger’ space for more storage per square inch. (A) That’s the only option we have. Very old homes (and even newer homes where the builder ‘cheaps-out’ on the closet) are nothing more than a single hanging rod and a wood or wire shelf. (B) We’re used to hanging everything up (I can still hear my Mom saying, “Michael, did you have up your clothes yet?”). It’s a habit and it’s been drilled into us – almost from birth (although I don’t think I was wearing any clothes then). (C) It goes back to ‘A’ above. We don’t have better options. We only have a shelf (with messed up piles) and a single rod. No drawers are there to allow us to hang less. 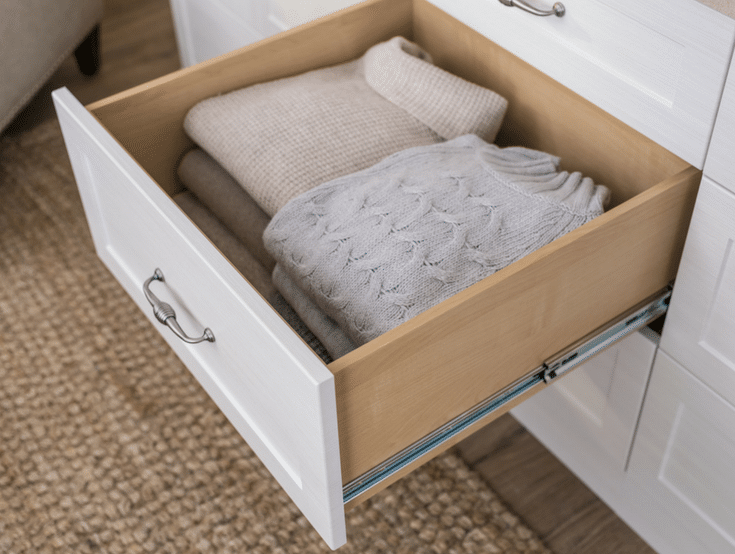 Reason 1 – You can get 2X as many clothes in a drawer folded up than you can hanging up (you can use this fun-fact at your next cocktail party). Reason 2 – Items like ties, silky camisoles, yoga pants and running shorts won’t fall ‘off’ drawers, but they do slide off hangers. 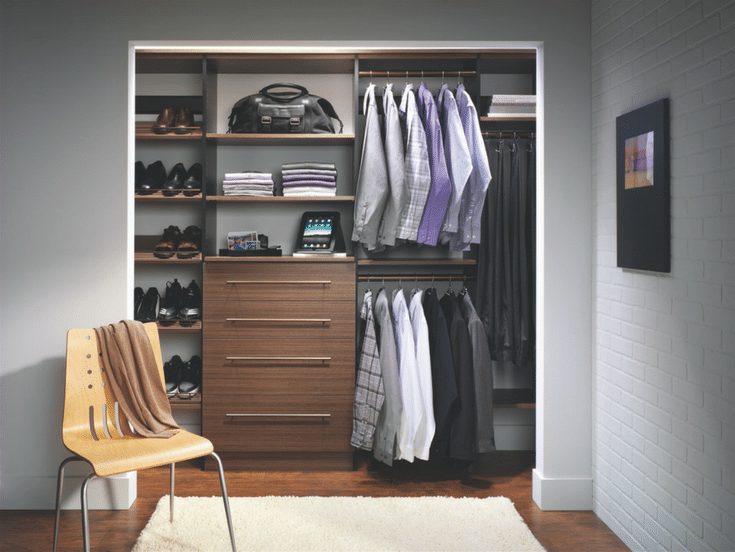 Reason 3 – Drawers make a reach in or walk in closet more visually attractive vs. a wall of hangers. Question: What do the 3 little pigs, the 3 amigos, the Jackson 5, the 3 Stooges, the Partridge family (now I’m dating myself) and the Kardashians have in common? Answer: They are all ‘groups.’ Some are wackier than others. Just like these ‘groups’ are thought of together, if you want an organized closet, your similar clothes will want to ‘hang together.’ (bad pun – I know). A neat closet (with a dose of OCD) has uniformity. Put your blouses with blouses, pants with pants, suits with suits. They will not only look neater, but you’ll find things quicker as well. When you think of a closet rod, it’s fixed to a wall or closet support section. It’s lack of ‘movement’ and adjustability makes it difficult to reach if you’re V.C. (vertically challenged) or have limited physical mobility (if you use a wheelchair or walker perhaps). Use a pull-down rod – These are perfect for shorter people, or someone in a wheelchair who wants to reach the top rod. 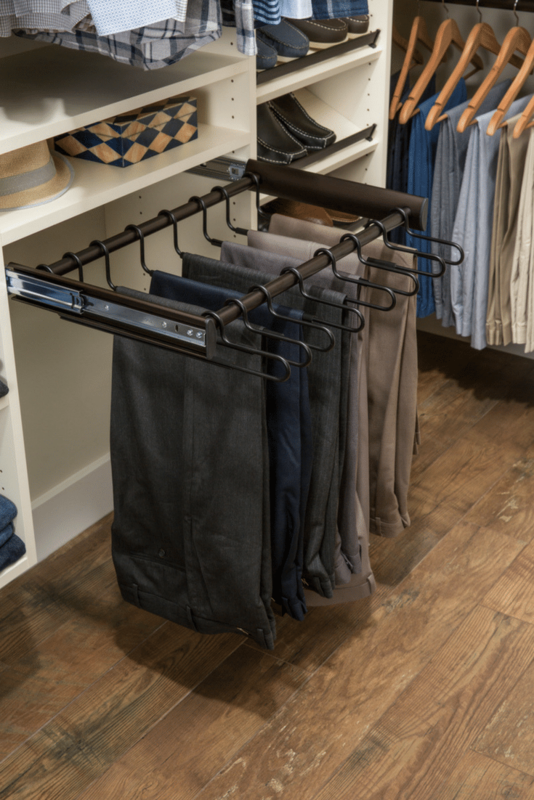 Use slide out clothing racks – These moveable racks keep your pants and scarves together and with rubber grips won’t fall off as they slide out. I’ll admit right up front, I don’t know much about yoga. The vision of my 58-year-old body in yoga pants is a funny enough concept. You’re probably wondering what yoga has to do with hanging clothes in your closet? Well – from my ‘massive’ (sarcasm intended) knowledge of yoga through my wife – yoga is all about flexibility. When I see poorly designed closet hanging systems (and most of them are – including the fancy ones built by expensive trim carpenters), the problem is the hanging is inflexible. You can’t move the rods (or shelves). There is a simple solution to this. Use closet support sections which are manufactured with increment holes. These holes allow you to change your triple hanging section (i.e. with 3 rods) for a toddler, into a double hanging section (with 2 rods) as they get bigger. If you change jobs and can chuck your suits and dresses for casual clothes, you can move the closet rod down and add another shelf. When it comes to the nightmare which is the hanging space in your closet – an improved space requires 2 things – (a) better discipline and (b) a better design. Going from messy to magnificent is not a simple process. If you’re in Central Ohio or a Columbus suburb like Dublin, Westerville, Upper Arlington, Pataskala or New Albany we’d love to help you with a Free 3D design. Call the numbers below. How can I (or my team) help you with closet organization solutions? 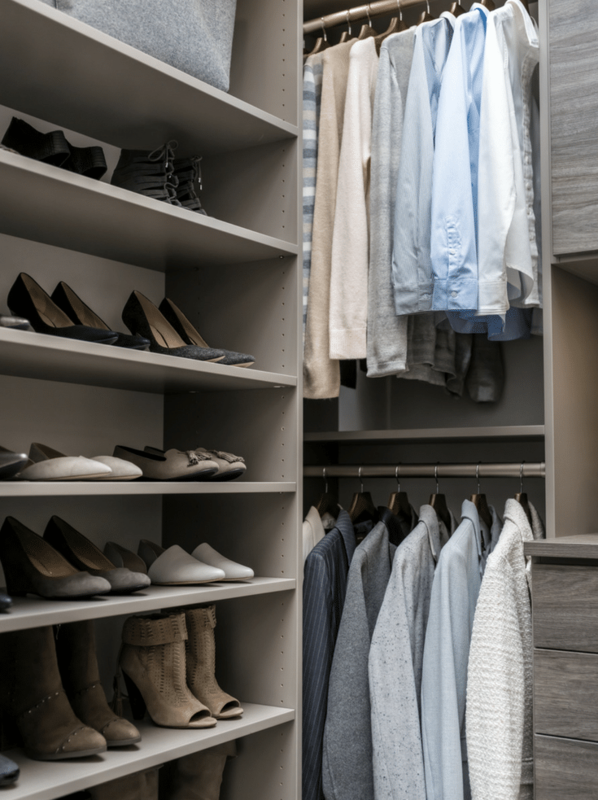 If you’d like to learn about how to get more closet organization ideas or a Free 3D design contact Innovate Home Org in Columbus at 614-545-6888 or in Cleveland at 216-658-1290. If you’re a Twitter fan please connect with me @Mike_Foti or my companies @InnovateHomeOrg or @InnovateBuild for information on home organization and interior design – and possibly a bit of bad humor thrown in along the way.